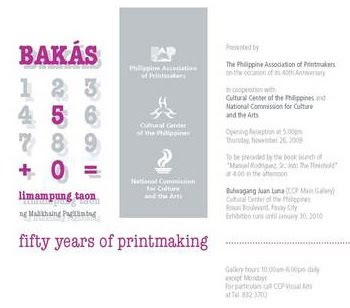 The Philippine Association of Printmakers (PAP) celebrates its 40th Anniversary with Bakás: Limampung Taon ng Malikhaing Paglilimbag (Fifty Years of Printmaking) at the Cultural Center of the Philippines. The exhibit opens on 26 November, Thursday, 5 pm at the Bulwagang Juan Luna (Main Gallery), 3/F Main Theater Building. The art of fine printmaking has drawn the interest of local artists since the 1950s. But it was not until the 1960s that training was made available to young artists through the efforts of Manuel Rodriguez Sr. In 1969, the PAP was formed with most of his students and himself as founding members. 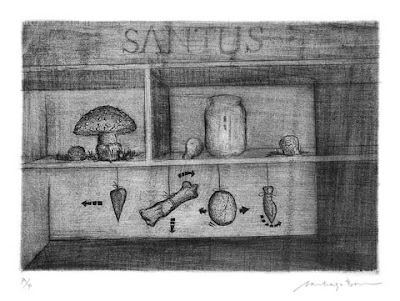 Printmaking may not attract as many followers as the art of painting but it continues to sustain a constant group of committed practitioners and advocates who have established their reputation in this fine art medium. Through workshops and lectures, PAP members have encouraged veteran and young artists to explore printmaking using traditional and experimental methods. Current PAP officers conceived of this anniversary event to give recognition to artists within and outside the PAP who have supported and promoted its cause. The exhibit begins with a brief historical overview marking highlights in printmaking practice and the growth of the PAP. 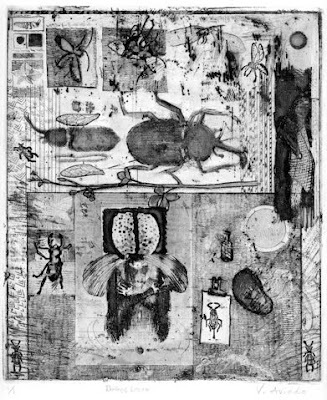 The main part focuses on the different printmaking techniques done in the four basic printing methods namely serigraphy, relief, intaglio, and planographic process. In each section works by artists across decades will reveal the range of styles and creativity that can be achieved through technical variations and experimentations. Selected works from the CCP print collection serves as the core of the exhibition. By itself, it is already a significant gathering of works. Other works are loaned from artists, institutional and private collections. Featured works include those by national artists Vicente Manansala, Cesar Legaspi, Jerry Elizalde Navarro, Arturo Luz and Bencab, and past PAP officials Adiel Arevalo, Ivy Avellana-Cosio, Brenda Fajardo, Imelda Cajipe-Endaya, Romulo Olazo, Pandy Aviado, Fil dela Cruz, and Raul Isidro. The exhibit will also feature artists who are not strictly practitioners in this art form but have incorporated printmaking techniques and concepts with different mediums, e.g., painting and sculpture, thus creating hybrid and mixed media works. These include Roberto Chabet, Gerry Tan, Raymundo Albano, and Fernando Modesto. Altogether, the exhibit will feature over eighty artists representing different periods, generations, and styles. The opening will be preceded by the book launch of Manuel Rodiguez, Sr.: Into the Threshold at 4 pm in the same venue. Mr. Rodriguez will be among the honored guests during the opening event. This exhibit is organized in cooperation with the Cultural Center of the Philippines and the National Commission for Culture and the Arts.
" Bakás: Fifty Years of Printmaking" will be on view until 30 January 2010.